Currently, moving files around using Windows can be a rather painful experience, especially when merging folders or handling duplicates. Microsoft is working hard to fix all of that with Windows 8, at least according to a blog post on the company’s brand-new Building Windows 8 blog. Currently, in Windows 7, moving or copying several files to different places at the same time can become rather chaotic, bringing up many progress dialog boxes that create a cumbersome user experience. With Windows 8, all of these dialog boxes will be consolidated into one, making it easier to manage all undergoing operations. Furthermore, it will be possible to pause current file transfers individually in order to speed up the remaining ones, as you can tell from the image below. 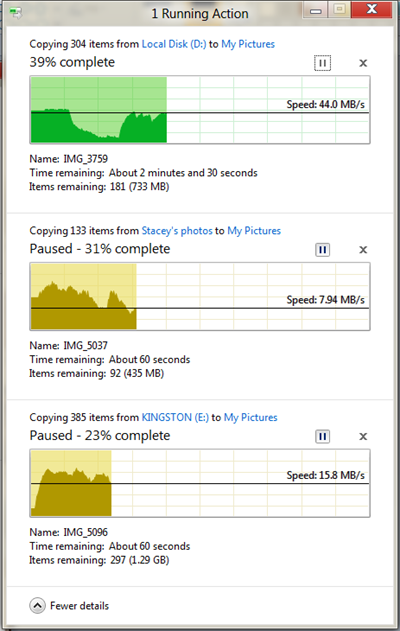 Speaking of speed, Microsoft is making quite a few improvements in this area, by allowing users to track at which speed their files are being transferred. With previous versions of Windows, the transfer speed was displayed, but now a graph will be included, making it easier to figure out if the speed of certain transfers is slowing down or speeding up. Most users might not make good use of this feature, but it’s good that it’s there for those who might rely on it. Microsoft has also made improvements in what it calls “conflict resolution”, or in layman’s terms, what to do when a file is being moved or copied to a directory that already has another file with the same name. 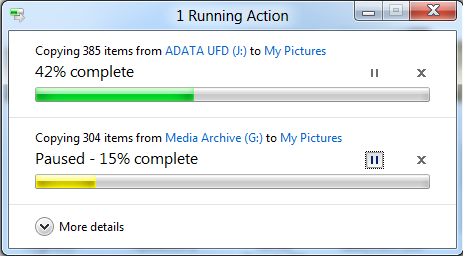 Previously, several dialog boxes would pop up asking users which action to take for each individual file. 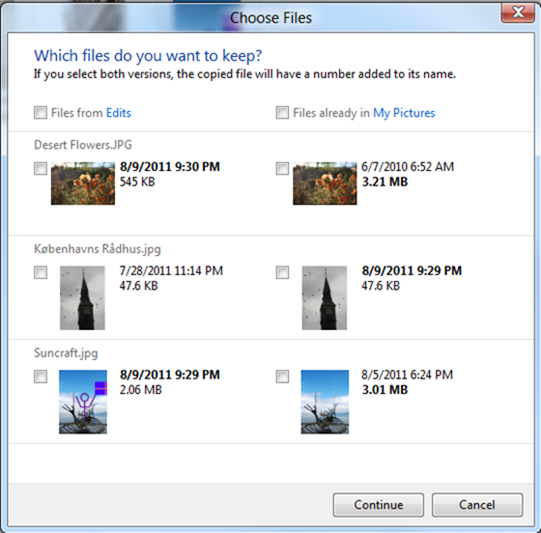 With Windows 8, Microsoft plans to consolidate it all into one dialog box, while displaying more relevant information about each file, making it easier to make the right decision when choosing which file to keep. With pictures, for example, a thumbnail preview will be displayed of both versions of all the conflicting files, making it easier to choose whether to keep the original one or replace it with a new copy. In order to simplify the process even more, Microsoft is removing certain dialog boxes it deems redundant, such as the well-known that asks whether to move a file or folder to the Recycle Bin. With these steps, Microsoft aims at making Windows 8’s file management work as efficiently as other third-party file copying and moving tools, such as TeraCopy. While the company claims that there will still be a market for these tools, Windows 8’s changes will certainly make it much more feasible to use Windows Explorer for large file operations.